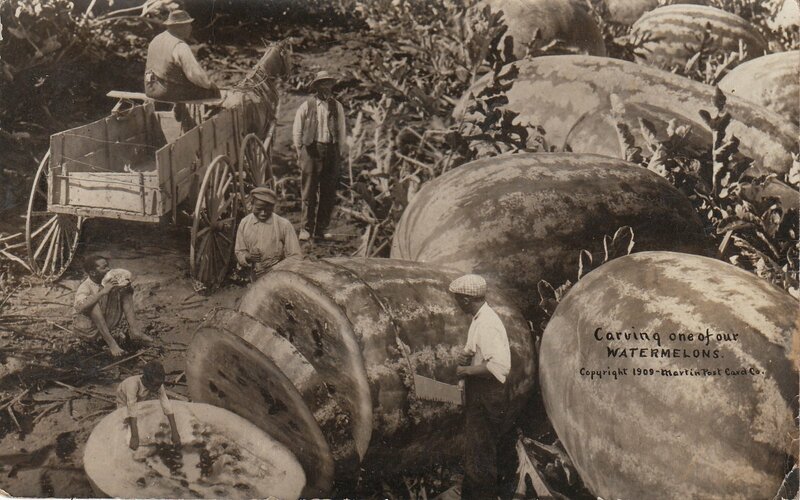 Exaggeration cards are picture postcards depicting enormously oversized fruits, vegetables and livestock. First appearing in Fresno in 1905 the cards quickly struck a chord throughout the western United States. These ”tall-tale postcards” became especially prevalent in small town rural communities hoping to forge an identity for themselves as places of agrarian abundance. The cards were surprisingly successful. One of the exaggerators of the first hour, Wiliam Martin, produced over 7 million cards in his first year of business and retired as a wealthy man only 4 years later. Many others, like Edward H. Mitchell, H.M. Brown, Alfred Stanley Johnson Jr. and J.H. White also built profitable print houses on the success of imagining myths of plenty. Tall-tale postcards affirmed the fundamental American myth of agricultural abundance, a myth often diametrically opposed to reality. If the ideal promised by the American Frontier did not yet exist in the real landscape, at least it might in an imagined one. In its series on Abundance Fantasies, The Incredible Shrinking Man investigates how the desire for abundance as part of the human condition may in fact become a driving forces behind our willingness to become smaller. Doing so would shrink us into a world of abundance, making exaggeration cards not a nostalgic remnant of the past but a visionary image of the future. Several vintage exaggeration cards will be on display as part of an The Incredible Shrinking Man research facility in the Future Food House during the World Food Festival in Rotterdam.